The “way home” is different for each person who is homeless. For some, it is a short journey from the streets to return to a supportive family. For others, it is a path to an apartment of their own. At Urban Pathways, our dedicated staff support and guide homeless men and women by providing housing and services that improve their quality of life. We help individuals regain their sense of dignity and make informed choices for their future. 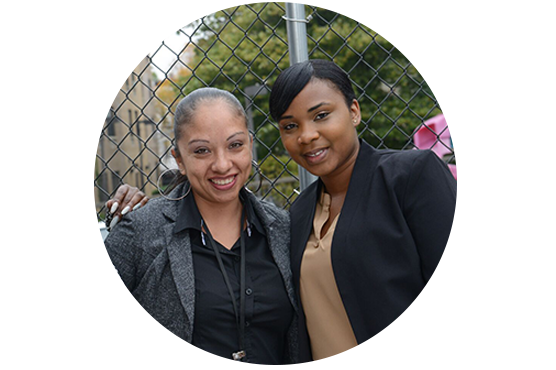 For many individuals who live on the streets, an Urban Pathways’ Outreach Specialist is the first contact they have on their journey toward stability. Outreach Teams address the needs of people living on the streets through consistent engagement, practical assistance, case management, assessment, and referral services. For homeless men and women have who lived on the streets for multiple years, and resist entering the shelter system or long-term treatment programs, the Olivieri Drop-In Center offers on-site, 24-hour services including meals, clothing, and showers. When a client is ready to talk with staff, we offer case management, crisis intervention, referrals to medical, mental health and rehabilitation services, and housing placement assistance. Since many of our clients at the Drop-In Center, and engaged with our street Outreach Teams, resist placement in large, city-operated shelters, our Safe Havens are an important alternative. Safe Havens offer intensive case management, housing placement assistance and other support to help men and women continue on their way home. Safe Havens provide transitional housing, are the cornerstone of our Housing First approach, and are not the final step in the journey. Urban Pathways provides a continuum of specialized housing programs to meet the needs of adults who bear the scars of mental illness, substance abuse, and the poor physical health which results from years of homelessness. Our Extended-Stay and Permanent Supportive-Housing, including single-site residences and scatter-site apartments, is designed for adults who face multiple barriers to independent living. All programs promote self-sufficiency and encourage residents’ participation in wellness and recovery-focused activities. These programs help our clients achieve their goals and become the people they want to be. The Medical Wellness Program offers a holistic approach to improve residents’ health by connecting them to community-based sources of health care, providing education on health and wellness, and reducing reliance on expensive emergency services and treatment. Our UPwards Employment Program assists participants in developing their resumes, completing job applications and preparing for interviews. We also address barriers to employment by matching skills and experience with employment opportunities. For many, our supportive housing is the final stage of their journey — they have found their way home. Other residents, who have developed the skills and connections needed to live independently, participate in our Moving On Initiative to help them fully re-enter community life. We support clients as they move from our supportive housing into apartments of their own. With our services, and the support of the Corporation for Supportive Housing and Robin Hood Foundation, our clients make the transition successfully. Through outreach and drop-in center services, transitional, long-term and permanent housing, and comprehensive support services, Urban Pathways helps more than 2,500 homeless men and women take control of their lives and find their way home.